He's probably trying to sell her an explainer video. 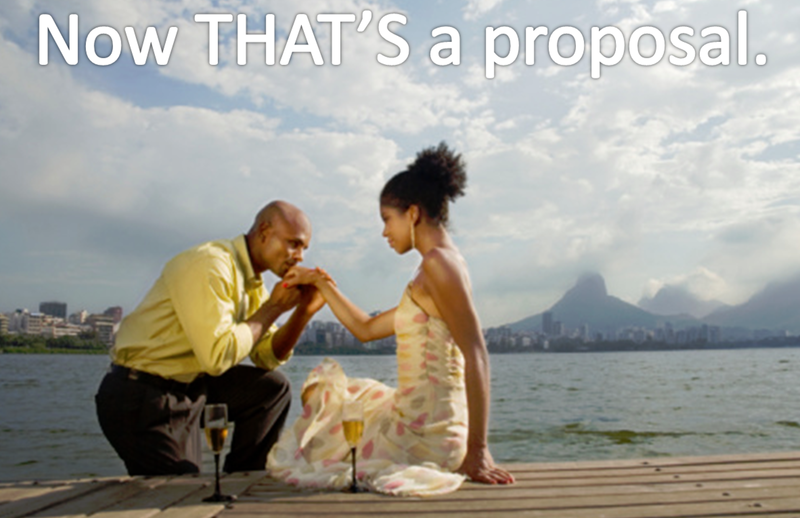 Business Proposals and Marriage Proposals have similarities. They are both an offer that will hopefully lead to a leap of faith in the form of a "yes" on the proposee's part. The proposer puts thought into the presentation and tries to emphasize the positive in order to influence a "yes." When saying yes to a marriage proposal, the target is trusting that you will be awesome to be married to and that you will not waste the life you are requesting. And in a project proposal, the target is trusting that you will be awesome at completing the project you are proposing and that you will not waste the money you're requesting. Before any money changes hands or work starts there needs to be a proposal at least. The proposal is like a contract, only it's more informal. 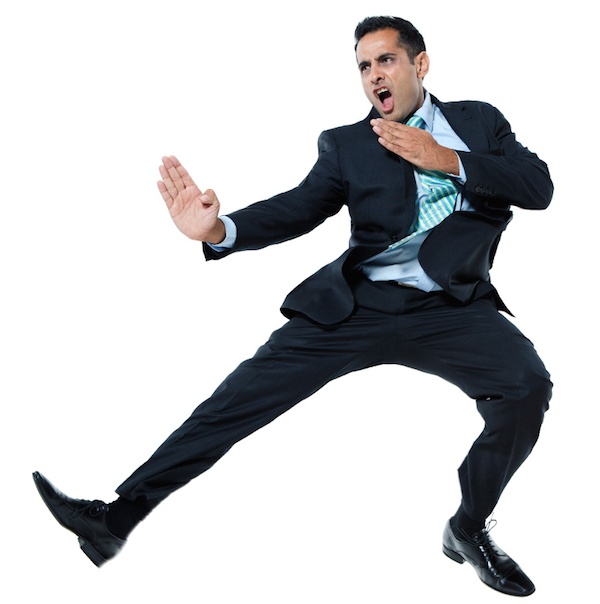 I tend to use proposals, but if I were dealing with larger projects where my risk is greater I would use a contract. Contracts often require a lawyer to write, review, and negotiate, so the expense can be greater. For a proposal you just make sure it says the stuff that needs to be said. So- you've met with a potential client. You've talked about the project and you have a pretty good idea of what they want. Then they ask you how much. This is a good place to say that you'll prepare a proposal for them (BTW I never give people numbers off of the top of my head, I always go back and think about it because there are a lot of moving parts in a project- preparing a proposal also gives you time to go through it and think it all out). So you go back to your place and make a nice little proposal. Not only is a proposal a written record of what you will be providing to the client, it is also a sales tool- the client can send it to their best friend or their business partner and the proposal should have all of the info in it that those people will need to decide that you are trustworthy without them ever meeting you or seeing you. The more money you are charging, the more they will want to know about you as well. 3. Project Summary- This section is a description of the project as you understand it. For example "This proposal is for a 1 minute 30 second animated pilot introduction in the style of 1960's Hanna Barbera Animation. Don't forget to specify the duration of the animated piece you are providing in all proposals!! 7. Payment Schedule- This is where you explain when in the process you will be expecting payment and how much that payment will be. From my experience I highly recommend getting a deposit before starting work because it shows that the client actually has money and is actually aware that they will be spending it if they hire you. I always tell clients that I start work when the deposit is received, not before. This is because it's not fair to put aside the work of someone who has paid for someone who hasn't. Some larger companies don't do this, and you probably have less need to require it because they person who is hiring you isn't spending their own money so they won't care so much about parting with it. When you're dealing with smaller businesses and individuals though, this is necessary. The most common way to handle this that I have seen is to either break it into 3 payments or 2 payments depending on how long the project will be. 1 payment in order to commence work, the second payment in the middle somewhere (like, after the animatic is approved for example, or after sketches are approved) then the third is upon completion. If the project is short then two payments will do- 1 up front, the 2nd upon completion. Specify at what point the payment will be required and how much it will be. - Something specifying that any artwork or others materials that client provides for your use are property of the client and that the client holds you harmless if a dispute arises over the ownership of something they have provided you. - Any other details you can think of. 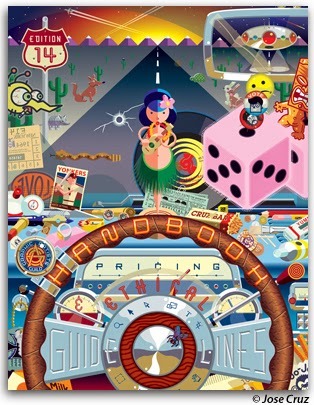 A good resource for this stuff is The Graphic Artists Guild Handbook: Pricing and Ethical Guidelines which is available in bookstores and online. They issue a new edition each year. Beware their pricing guidelines run high. They also have sample contracts and other issues to consider for graphic design, illustration, animation, licensing, etc. 9. A signature area- Once your client and you sign this it is your agreement and you can refer back to it in case any confusion arises. 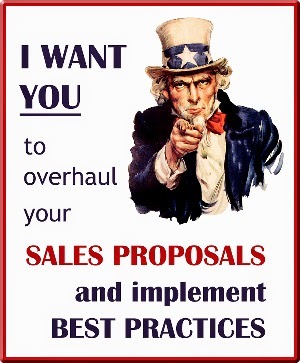 The idea is to hone your proposal so that everything that could happen is covered. Always make sure they sign +return it. Some people don't- if they don't then don't do the project. If they request changes to it, listen to them and see what you think about the changes. 10. Client's contact information- Have them list their main methods of contact like email, phone, mailing address so you have it all on record. And there you shall have a proposal. Keep an eye out for the next post! Some good information here for animators and illustrators alike —thanks! I use the GAG Pricing handbook occasionally for design and Illustration, and I've found it to be an indispensable studio tool. Even more so when I was starting out. I'd beware though, of making a blanket statement like "Beware their pricing guidelines run high". Pricing is very relative and is based on many factors (some of which the handbook takes into account and explains). The subject comes up often on LinkedIn discussions, and the opinions are varied and often heated. I, and other illustrators I've talked to, contend that the numbers in the GAG Handbook are too low. They give ranges, of course, and certainly the quality, style and technique used for the work has to be taken account as well as the experience and the fame of the artist (the handbook can't cover all these variables because many are subjective). For an illustrator that has to share his earnings with a rep and support a family of four, the numbers in the handbook are very low indeed. It's also worth mentioning that lately, artists rates have not been keeping pace with the rising cost of living. Above all, an artist can't go straight to the charts and bypass all the other info that affects pricing (the complete transfer of copyright being the biggie). The book has to be well-read to be useful. I applaud you for focusing on business, however, since so many art schools skirt the issue. It's not terribly fun, but it is terribly important. As artists though we can't forget that we are providing a product or service and that the market determines the amount that people are willing to spend on our product or service. If someone does stick figures in crayon on notebook paper but they have the right name, that can go for much more than someone who toils over an oil painting for a month etc. The amount of work you put into something doesn't completely relate to the amount that it sells for. My idea is that if you need GAG to price stuff for you its because you aren't sure how much to charge- if you're not sure how much to charge then it's because you're inexperienced, because once you get rolling, figuring out how long stuff takes you/how much you need to live makes it easier to decide on your own if you want to do a job or not without having to refer to a book. If you're inexperienced, you're not going to be charging as much as the people who are surveyed who are making the amount of money that is listed in the book. That's why the prices seem high to me. If I followed the numbers in that book I wouldn't have ever gotten my first job and I would probably not be working right now either because the book is kind of looking at the world through rose-colored glasses. Also, If you have an agent etc then you won't be setting pricing- your agent will and they will also take a piece of it, but they can also negotiate better and connect you with larger clients easier. If you don't have an agent, then the price you set will be based upon how much your client can afford and how much you want to make it worthwhile. Different sizes of businesses have different budgets - it just depends on what you as an individual are willing to work for. And the GAG book isn't based on those conditions. This may be one of those instances where the varied audience of the internet creates difficulties. True, the prices in the GAG handbook will likely be on the high side for a beginner. If you are addressing beginners, I'd say you are spot on. I would encourage young artists to carefully consider foot-in-the-door rates, realizing that those rates will have to grow with the artist's experience. But if buyers of art see a statement like "the GAG prices run high", that could be troublesome for our industry. I think the mere existence of a guidebook like this has something to do with prices remaining flat, because artists will use the numbers as gospel or even undercut them. Whatever you think of the numbers, I don't believe the Handbook looks at the world through rose-colored glasses —or any kind of glasses. I'm under the impression that they interview/sample as many artists and designers of various disciplines and try to report on what the average rates are. In fact, I think that may be the only legal way to publish such a book without being accused of price-fixing. The reason I'm so fixated on this is that even top-notch illustrators make the same mistakes as beginners. Many of them bypass their reps and make colossal mistakes. There was a huge heated discussion on Drawger a few years back when an artist (one of Richard Solomon's) blogged about a small job that turned into a job from hell. After he disclosed what he was paid, he was expecting sympathy and instead he got a firestorm. Anyway, great post —your advice on taking several hours or overnight to generate a well-thought quote is excellent.